Heat strengthened glass is emerging as an innovative countertop surface. It can be fired into various textures such as deep waves. Many colors are available as well as clear with LED lighting for special color effects. It can be cut and polished into moast any shape. 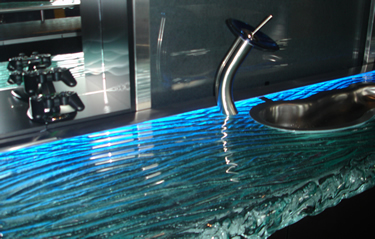 Sinks can be molded into glass-countertops for an integrated look, or they can be top mounted. Raised glass eating bars fabulously accent bar and island areas. 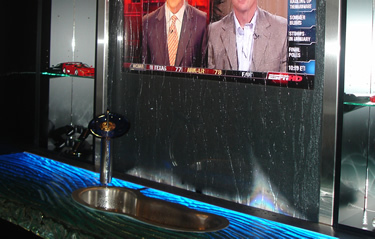 This glass top was custom fabricated by Aspire Glass in Florida for this project.